My name is Rachel and I think I might have a sighting. I did not personally see this creature, but my boyfriend and roommate did earlier this evening. I guess it was stocky, and the story is that it was running around our back yard and quickly jumped into the tree you see it in. It appeared to have a bushy tail. So I am just perplexed. They also said that it could probably take on our dog (who is a 40lb 3 year old beagle) so I think it is probably 20-30 lbs or maybe more. The picture is from far away, but if you zoom in you can get a pretty good look at it. We can’t figure out what this thing is! I live in Mankato, MN (located in the south central part of Minnesota) Let me know what you think! Well, Rachel, I have spent a lot of time looking at beaver-like mammals and have become quite adept at identifying them. It seems clear to me that what your boyfriend and roommate saw is a Tasmanian Devil. According to Wikipedia, the Tasmanian Devil has a “squat and thick build”, which is consistent with the word you used – “stocky”. In addition, the Tasmanian Devil stores body fat in its tail. In my professional opinion, your boyfriend and roommate did not see a bushy tail, but rather a fat tail. You are very lucky to live in close proximity to a creature that is so rare in the midwestern portion of the United States. Please note that although a Tasmanian Devil can run as fast as 8.1 miles per hour for short distances, it is no match for a dog. 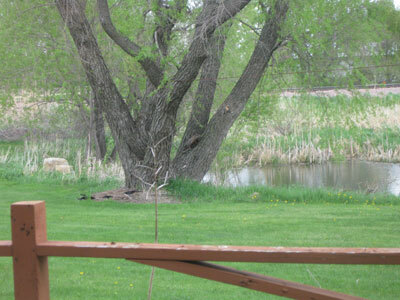 We have 2 beaver living under our dock. One is large, estimated to be 30-35 lbs with a shiny brown coat that lays flat. The other is smaller, a bit more shy, but the coat is much different. The coat has hair that doesn’t lay as flat on the body, and the tips of the hair are white. They sit together in the same cubby under the dock, but the larger one is more social and out more. Why is there a difference in the coat? Is this the male/female identification? It sounds like the beavers you are describing are of two different generations. Perhaps parent and child? This would explain the difference in coat type. It is normal for younger beavers to favor different hair styles than older beavers. They tend to go for a edgier, more “radical” look. They don’t want to look too “square”. Just an FYI – Rachel did NOT see a Tasmanian devil (Sarcophilus harrisii) – not unless she was in Australia at that time. Or unless you are using the name of a different animal that is NOT a Tasmanian devil, but you just call it that for some reason. 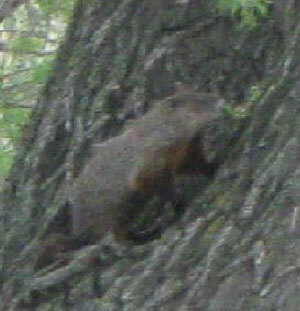 Lynne – While I understand a woodchuck might be in a tree, surely a GROUNDhog would never take up arboreal pursuits? Unless it was showing a holidaying Tasmanian devil the local sights?